Grinders are essential pieces of marijuana paraphernalia. From producing a smoother smoke to making cannabis easier to carry, there are many reasons why grinders deserve to be part of your arsenal. Many smokers may hesitate at the upfront cost, but if you are a regular cannabis consumer, you will find the investment to be well worth it in the end. Before you go out and buy a grinder, there are a few things you should consider. WHY SHOULD YOU GRIND YOUR WEED ANYWAY? Grinding your weed before smoking or vaping it, will simply make it much easier to use. You will also find that grinding cannabis will make it easier to carry, and more enjoyable to smoke. Ground weed is typically less harsh, because it is so much more consistent. Unlike whole buds, whose shape can affect the fluidity of the smoke produced, ground weed will smoke cleanly and evenly. When it comes to joints, this means being able to roll tight, smooth joints that smoke efficiently. When it comes to bowls, using ground weed will allow you to avoid unpredictable hits and cherried bowls. Moreover, grinding your herb before use will limit its contact with your hands. This will prevent the trichomes, and the precious cannabinoids they carry from being damaged. 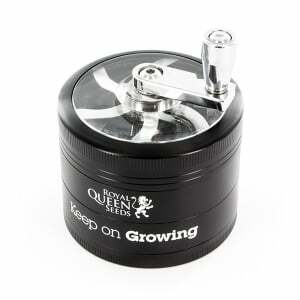 As such, using a grinder will help to maintain the quality and potency of your buds. 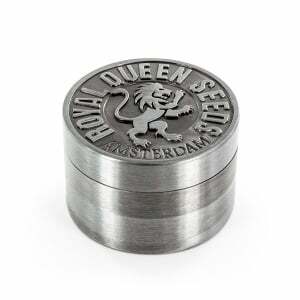 Instead of losing those trichomes, a good grinder will let you collect them for later enjoyment. Kief is a term that refers to the fine trichomes and cannabinoids that collect either in the bottom chamber, or on the walls of your grinder. Kief is much more potent and purer than regular buds. Enjoy responsibly, because the intensity of its high may surprise you. Kief crystals can be added to bowls, vaped out of most kinds of vapes, or sprinkled into joints or blunts. They can also be cooked with, after prior decarboxylation. If you are considering buying a grinder, investing in one with a kief chamber is well worth it. Smoking or vaping ground weed will really bring out the natural flavours of its terpene profile. As you open the main chamber of your grinder, you can expect the natural odour of the strain to overwhelm you. While some people may only care about getting high, many will find that the improved taste and flavour of ground bud really enhances their smoking experience. Carrying cannabis around in a small grinder can be pretty convenient. Most metal grinders feature magnetic casings that ensure your bud stays stored away safely, even during transportation. Furthermore, a well-built grinder can help you to better manage odours that may otherwise be troublesome. You may also be surprised by just how much cannabis your grinder can carry at once. WHAT KINDS OF GRINDERS ARE THERE? Grinders can differ in shape, size, price, and functionality. The style of grinder you choose will depend on your needs and your budget. For those looking for maximum portability and cost efficiency, a small two-chamber grinder may be best. Whereas those looking for power and speed may be better off investing in an electric grinder. Electric grinders are super convenient because they do all of the hard work for you. The main downside to electric grinders is the power requirement. Unless you have a battery-powered grinder, you will need a power outlet to use one. Electric grinders also have a tendency to overdo it, completely pulverizing and crushing your weed during the grinding process. Because of these disadvantages, electric models tend to be less popular among smokers. Unless you have to grind a large amount of bud quickly, you are probably better off using a manual grinder. This is the most basic kind of grinder you can find. The two-piece grinder is just that, two pieces that close together to grind your weed in a single chamber. The inside part of each piece should be layered with sharp teeth. This type of grinder has no catch chamber for kief. Instead, it tends to get mixed in with the ground bud or stick to the sides of the chamber. Because of their simplicity, two-piece grinders are on the cheaper side of the price spectrum. Moreover, these kinds of grinders tend to be made from a variety of materials including wood, plastic, and metal. While plastic or wooden grinders may be cheaper, metal grinders are much more durable. These kinds of grinders are the most popular among regular smokers. While they may be a bit pricier than the simpler two-piece grinders, the added functionality is well worth it. This style of grinder has 3 chambers: one for weed to grind, one for ground weed, and one for catching kief. 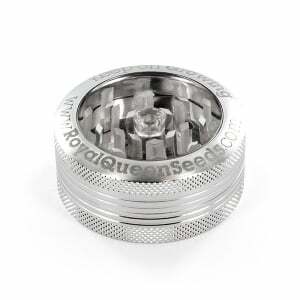 The crystal catcher alone makes this type of grinder worth the extra expenditure. That trove of kief can come in really handy on a rainy day when your stash runs out. This kind of grinder is typically made of metal, for added durability. Card grinders are pretty rare out in the wild. While they may be easy to store and carry, they are also messier. Card grinders are built similarly to food graters. They are composed of a single piece of metal with a multitude of small holes, or a fine screen, for grinding purposes. Card grinders are very inexpensive and cost-effective. HOW DO YOU USE A GRINDER? Two-piece and four-piece grinders can be properly used in just a few simple steps. This should give you access to the main chamber, allowing to insert your buds. Use your fingers to break up the bigger nugs that don’t fit well. Make sure to avoid placing anything in the centre of the chamber. This is where the grinder pivots, and in case of metal grinders, there tends to be a magnet to help keep the lid on tightly. Anything placed in the middle will not be ground. After setting your bud in place, put the lid back on. Press it down, shutting it tightly, twisting it a bit if need be. Give the lid about 10 to 15 clockwise rotations, while applying a bit of pressure. Tap the sides and the top of the grinder a couple of times during and after the grinding to make sure everything gets processed. After grinding, carefully unscrew the lid off of your grinder. Be gentle, as ground cannabis can fall out of your grinder if it is stuck to the top, or if the grinder is being held unevenly. Simply load your ground cannabis up into your joint or pipe and enjoy! Don’t forget to make use of those precious kief crystals! After grinding a few grams of cannabis, you will probably have enough kief for a full bowl. You can craft a kief scraper tool out of a torn bit of paper, or preferably, very thin cardboard. Specialized scraping tools are available for purchase, or may even come with your grinder. It is important to clean your grinder so as to ensure that it keeps working as intended. Moreover, a thorough clean may reward you with bud or kief that may be stuck in certain parts of your grinder. Too much resinous build-up on the insides of your grinder can make it harder to use, eventually clogging it up altogether. There are several techniques that can help you to clean your grinder as efficiently as possible. Using a small, fine toothbrush to dig away at hard to reach spots will result in a more thorough clean. If that does not work, grinders can be soaked in isopropyl alcohol, salt, and warm water for a few minutes before cleaning. Also, rubbing away at trouble spots with a mixture of isopropyl alcohol and salt can solve most problems. Finally, freezing your grinder before cleaning may help you knock loose some of those stubborn clumps of resin.